Italy’s Economy Minister Giovanni Tria has postponed talks scheduled for Wednesday with his French counterpart amid a row over a migrant ship. A French official said the ministers had agreed by phone to meet in the coming days instead. The development came on a day of diplomatic twists between the nations. 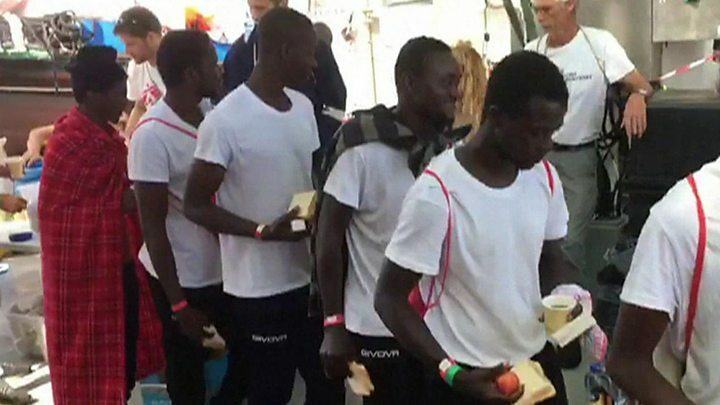 Earlier, Italy had summoned the French ambassador after France’s president attacked it for not allowing a rescue boat carrying 629 migrants to dock. 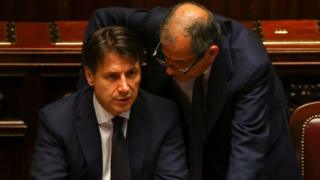 There were also suggestions that a scheduled meeting between Italy’s Prime Minister Giuseppe Conte and French President Emmanuel Macron should not go ahead in Paris on Friday. 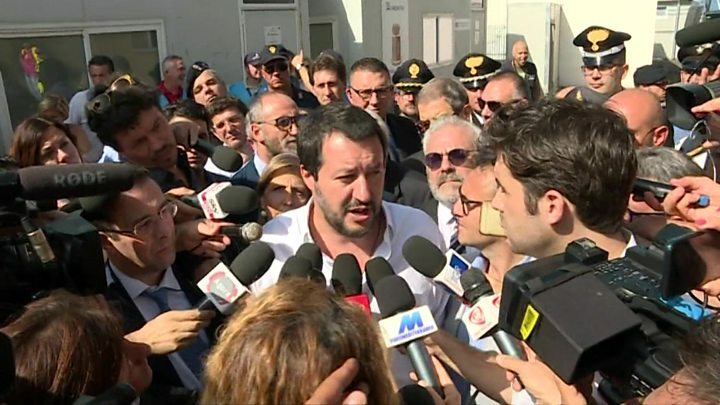 Italy’s new right-wing Interior Minister Matteo Salvini said it “would be right not to go to France” unless Paris officially apologised for its comments on the rescue ship. President Macron urged both sides not to “give in to emotions that some people were manipulating”, and he appeared to accuse right-wingers in Italy’s new populist government of whipping up the situation. On Sunday, Mr Salvini refused to allow the NGO ship Aquarius to dock in Italy’s ports. Eventually Spain said it would give “safe harbour” to the ship to avoid a humanitarian disaster and the Aquarius is now making the long journey to the port of Valencia escorted by two Italian ships. But Rome’s decision to turn the Aquarius away prompted stinging criticism from a number of French officials, including Mr Macron, who was quoted as saying that Italy had been “cynical and irresponsible” to turn it away. A spokesman for Mr Macron’s party infuriated the Italian government by describing its position as “sickening”. “It’s unacceptable to play politics with human lives, which is what is happening at the moment,” said Gabriel Attal. Prime Minister Giuseppe Conte hit back at France, calling its stance on migrants “hypocritical”. While many are seen as economic migrants, some are fleeing war and persecution, and have a right to asylum as refugees. In the past five years, Italy has taken in more than 640,000 mainly African migrants. Are other ships caught up in the dispute? Yes, in the short and longer-term. On Wednesday an Italian coastguard vessel docked on the Italian island of Sicily, carrying 937 migrants and the bodies of two people who had died making the voyage. The fate of the ship, the Diciotti, highlights the difference in the government’s attitude to Italian ships and those linked to foreign NGOs. The migrants on board were not picked up by charities but by the EU’s naval rescue mission off Libya. Mr Salvini has insisted that NGOs operating rescue ships in the Mediterranean under other countries’ flags have no right to bring immigrants to Italy. He has previously said he is considering action against organisations that rescue migrants at sea. What has the wider reaction been? The UN’s refugee chief Filippo Grandi has urged the EU to address its “shameful” refugee policy, and “reform its asylum system in a collective manner”. “As a European, I felt shame – shame – that there was a boat – there is a boat – in the Mediterranean, and for several days nobody wanted to take these people,” Mr Grandi told Reuters. France’s foreign ministry has said that it is “perfectly aware” of the strain Italy is under as it negotiates an influx of migrants from Africa. It said France is “committed to co-operation and dialogue” on the issue. BBC Europe editor Katya Adler says that as a result of Italy’s moves this week, European leaders are being spurred into action, or are at least considering it far more seriously. German Chancellor Angela Merkel called for a unified approach, describing the migration issue as a “litmus test for the future and cohesion of Europe”. She has come under continued pressure from her own interior minister, Horst Seehofer, who wants to tighten up German policies by sending migrants away at the border if they have registered in other EU member states. He met Austrian Chancellor Sebastian Kurz on Wednesday and the two said they had reached agreement with Italy on a strategy to combat illegal immigration. “We believe an axis of the willing is needed to fight illegal migration,” Mr Kurz told reporters. The pair said they backed sending German and Austrian police to Albania to prevent a new migration route opening up in the Balkans from Greece.